Celebrate the life and legacy of your loved one in your landscaping using this Whitehall Standard "Living Eternally" Alexandria Memorial Lawn Marker. 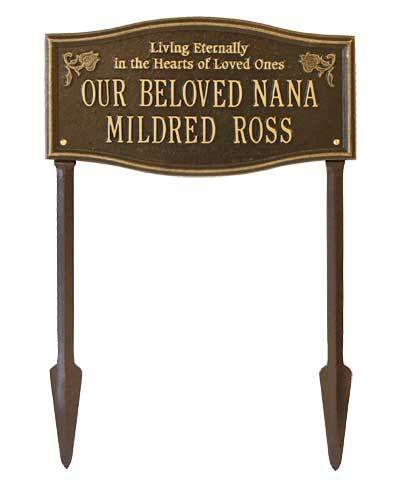 Crafted from lasting aluminum, this sign offers a wonderful way to commemorate one that has passed on. The rectangular edges contrast the rounded top and base, while the phrase "Living Eternally in the Hearts of Loved Ones" adds a wonderful sentiment. Small rose figures flank this phrase, and the next two lines may be customized. The top line accommodates up to seventeen 1.5" tall characters, while the bottom line holds up to fourteen characters, also 1.5" tall. Two predrilled holes at the base allow you to connect the included, 18" long stakes, for placement in soil. Immortalize your departed relative using this Standard "Living Eternally" Alexandria Memorial Lawn Marker. Made in the USA. An antique brass marker is pictured using the color code "AB".